The leaves are generally dried and milled to be used as tea or a flavour ingredient. Lemon myrtle can be harvested year round, although wet season should be avoided. Its flavour and aroma show refreshingly intense citrus notes, often described as lemonier than lemon. 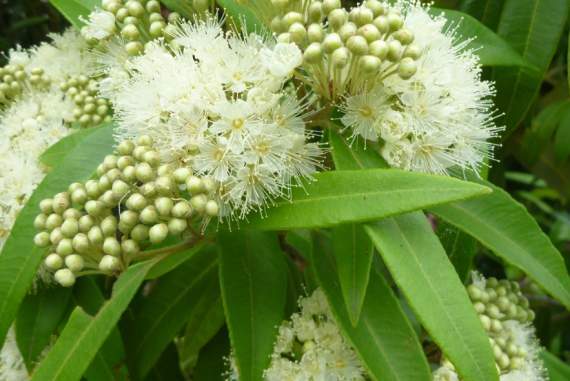 Lemon myrtle is used in a variety of sweet and savoury dishes. The milled leaves are often used to impart a distinctively clean and crisp citrus flavour in teas, drinks, syrups, glazes, cakes, biscuits, dressings, mayonnaises, sauces and ice creams. It can be used as a substitute to lemon grass in cooking, and is particularly popular as a flavour enhancer in curries and pastas. Essential oil is used as a flavouring ingredient for products such as beverages, liqueurs, flavoured oils and sauces. The essential oil is also used as an ingredient in cosmetics and personal care items such as soaps, creams, toothpaste and shampoo and conditioners. Lemon myrtle has also been used for many years as a therapeutic aromatherapy product for oil burners or as a misting spray. Lemon myrtle has antimicrobial and antifungal properties that are superior to those of the popular tea tree oil. As a result, it has potential as a natural food preservative; as an antiseptic, surface disinfectant; and in the biological control of post-harvest diseases in fruits and vegetables.